On Thursday, Stewart Rhodes of Oath Keepers posted a bulletin on the organization’s blog reporting on federal agents demanding a food storage cannery in Tennessee turn over customer lists so they might discover who is purchasing bulk storable foods and storing it at the facility owned by Mormons. As Rhodes notes, it is part of Mormon Church religious doctrine to store food for hard times and emergencies. 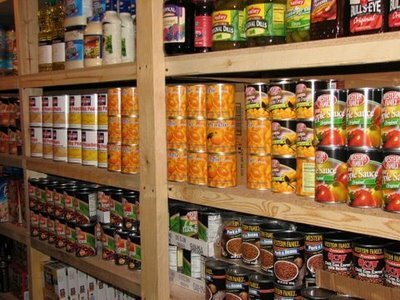 Church doctrine states that each family store a year’s worth of basic dry goods along with three months worth of store-bought canned and boxed foods. “These Church canneries also often sell food storage items to non-church members, seeing it as both morally right and prudent to help their neighbors store food, whatever their faith,” Rhodes explains. He then speculates as to why the feds would demand customer lists. “DHS/FEMA wants to know which Americans have food storage so the federal government can at some future point confiscate that food. Just as with lists of gun owners, compiling such lists is the first step toward future confiscation,” he writes. In fact, the government codified the concept of food confiscation and redistribution when president Kennedy issued Executive Order 10999 on February 16, 1962. 10999 was one of several executive orders signed by Kennedy under the rubric of “national emergency” that extended extrajudicial power to FEMA, including the ability to control communications, energy, food, fuel, farms, transportation, highways, railroads, inland waterways and seaports, health, education and welfare. The EO also allows FEMA to organize citizen work brigades under government control and undertake the relocation of the population. 10999 also gives FEMA the authority to control all public storage facilities. On June 3, 1994, president Clinton consolidated all previous FEMA executive orders into one all-encompassing order, #12919. As many have noted, FEMA is not an emergency agency. It is a martial law agency. It is often referred to as the “secret government” of the United States. If we take the above into consideration, it makes sense that the feds would be interested in keeping track of facilities storing food supplies.